Considered one of America’s foremost sculptors, Glenna Goodacre has been capturing the essence of her subjects for nearly 50 years. Her extensive body of work includes many iconic pieces—from the Vietnam Women’s Memorial and the Irish Memorial in Philadelphia, to the Sacagawea dollar coin and her larger-than-life bronze of Ronald Reagan, housed in the latter’s presidential library in Simi Valley, California. 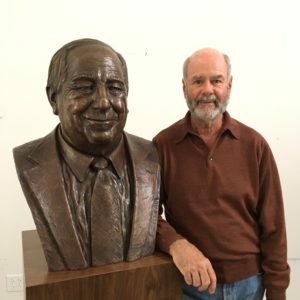 Dan Anthony, next to his bust of Jack Jonas, Jr.
Glenna has always taken a hands-on approach to the business side of being an artist, and for the past 30 years, she has relied on the steadfast support of her manager, Dan Anthony, who is a sculptor himself and previously served as the director of the Shidoni foundry and galleries in New Mexico. In March 2007, Glenna suffered a stroke, which affected her ability to work as she once had, prompting her decision to retire last year. Dan has been instrumental in helping her to make this transition, and during a recent interview with CHF Editorial Director Sofia Perez, he spoke on Glenna’s behalf, addressing some of the steps the two have taken to protect her legacy and estate. SP: Why has Glenna retired? DA: Glenna decided to retire in 2016, after 47 years as a sculptor. Because of her health, it was getting difficult for her to do the physical work of sculpture. Also, her studio was downstairs, and that presented too much of a hazard for her now. We agreed that the time was right. SP: She destroyed all of her molds. Why was that an important step? DA: In an estate-planning meeting that took place a few years ago, Glenna’s attorney and accountant advised us to destroy her rubber and plaster molds for bronze casting, and to do it sooner rather than later. A sculptor’s molds represent potential income for the heirs of her estate, which means that the IRS can tax the proceeds of works that have yet to be cast from these molds. We’re not destroying any existing bronze casts—just the molds. SP: What other practical business concerns do sculptors and other visual artists need to consider before they retire? DA: Sculptors have a lot of stuff—actual physical objects—to contend with, even more than painters, and they have to find a home for these things. In 2006, we chose to place Glenna’s archives at the Dickinson Research Center, which is part of the National Cowboy & Western Heritage Museum and Cowboy Hall of Fame in Oklahoma City. Dickinson also has the voluminous archives of James Earle Fraser, the sculptor responsible for End of the Trail and the Buffalo nickel, and his wife Laura Garden Fraser, who designed the George Washington quarter. Most of the material surrounding Glenna’s creation of the Sacagawea coin went to the Smithsonian, and some of it is actually on display at Washington DC’s National Museum of American History, in their numismatic collection. In addition, we dissolved her corporation—Glenna Goodacre Ltd.—at the end of 2016 in favor of a simpler sole proprietorship. SP: More than 100 of her works were auctioned in Scottsdale last month, including a rare marble piece, as well as some paintings and drawings from Glenna’s personal collection. DA: Yes, the auction brought in about $1.4 million, and her bronze Puddle Jumpers—which captures six life-sized children in mid leap—sold for $409,500, setting a world sales record for Glenna’s work. Beyond the sales that were made, the event was a success in another way—it was a true retrospective show of her art, and it served as an actual and virtual reunion of devoted Goodacre fans from across the US. SP: What steps has Glenna taken to protect her artistic legacy? DA: We tried to place many of her works in public and museum collections, and we succeeded. Finding a good home for the archives was also a key part of protecting her legacy. We wanted to be sure that those materials were conserved and accessible to art historians and others. SP: Has Glenna always taken such an active approach to managing her business? DA: As she began to have success as a regional sculptor, Glenna’s advisors suggested that she establish a corporation, which she did in 1979. 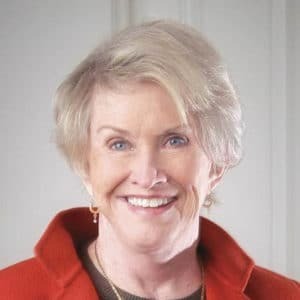 Initially, it was for tax advantages, but when she created larger public works later on in her career, she also needed the liability protection that a corporation provides. When I started working with her in 1987, I mapped out a comprehensive business plan, which we began implementing immediately. That freed her up to work exclusively in the studio and enabled her to produce much more work than artists who run both an office and a studio. However, even though she wasn’t handling the day to day, she still knew what was going on with the business, and she had the final word on those matters. SP: Why is it so important for artists to learn business skills? DA: Artists need to think of themselves as professionals and act accordingly. Too many artists have terrible business skills, and that’s a problem. Artists should learn how to tackle these tasks or get good advisors to help them, if they can afford to do so. If they decide to hire others, however, they still need to keep tabs on what’s being done on their behalf and direct the people they have hired. Outsourcing the work is not the same as forgetting about it. 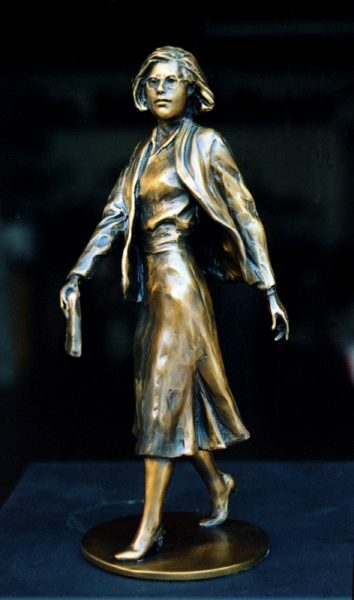 SP: One of Glenna’s sculptures, entitled CEO, depicts a businesswoman, and Glenna’s daughter, Jill, served as the model for it. What inspired that piece? DA: It was part of a large public art project called Sidewalk Society. The piece depicted a life-sized woman with a briefcase, and we were struggling to come up with a name for her. Eventually, we hit on CEO. We had worked with a lot of male executives on our various projects, so it was refreshing for us to portray a female CEO. Jill happened to be in town, and she modeled for us in several riotously funny sessions. 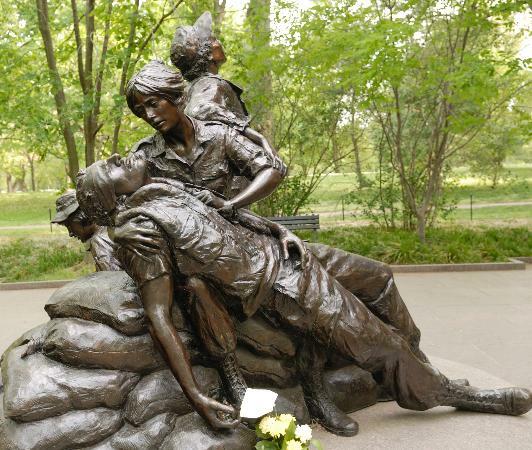 SP: Glenna is well known for her public art, including the Vietnam Women’s Memorial and the Irish Memorial. 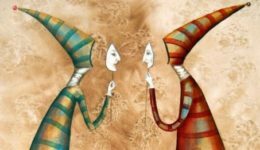 What were some of the unique business challenges she faced in securing and executing those commissions? DA: One of the key components of my plan for Glenna was to enter as many U.S. public art competitions as possible. I wanted to help her go beyond being a regional artist and make her more of a national figure. We won almost all of the competitions we entered, except one, I think. It took many years to complete these projects—some of them were huge. There’s not a big profit margin in large-scale public works, so you have to manage them very carefully or they can quickly become unaffordable. It’s very easy to lose money on them. Lots of it. SP: How did she manage to juggle those huge public and private commissions with her other work for shows and galleries? DA: When it came to Glenna’s drawings and maquettes, I handled the entry proposals, as well as all of the details, such as the contracts, engineering, casting, delivery, and installation of the large pieces. I organized one- and two-person gallery exhibitions, entered her into countless group shows, museum shows, and annual exhibits, and wrote press releases like crazy. I pushed the paper while Glenna pushed the clay—although I pushed a little clay, too, when we got behind. SP: Glenna recently donated her final new work to CHF (see below). Why was it important to her to support fellow artists in their business development? DA: We donated all of Glenna’s studio materials, clay, equipment, tools, and books to the New Mexico School for the Arts, an arts-based high school in Santa Fe. An avid newspaper reader, Glenna has been watching the school grow since its opening was announced in the local press in 2010, and she said she wanted to give these kids opportunities that she didn’t have as a young artist. 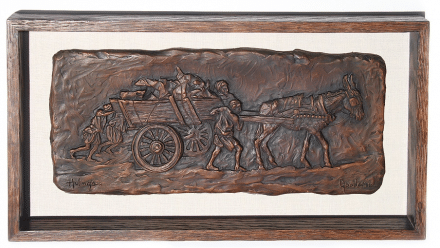 Before her retirement, Glenna Goodacre created her final original work, a bronze bas-relief inspired by her friend Clark Hulings’ drawing Helping to Push. Only 25 will be cast. This unique collaboration benefits CHF and will be available exclusively as a thank you to major donors. For more information or to order yours, click here.